Yes it's true, I'm hosting a giveaway. And it's a Honey Jr giveaway. Well I'm not giving away him per se, but some of his candles (I wonder how many entries I'd get if I gave away Honey Jr?). Honey Jr has made beeswax candles with his own two honey hands and has kindly given them to me, so that I can pass them on to one of you. I had wanted to take a photo of Honey Jr with his candles, but you know, Christmas happened, and now Honey Jr has gone off to Thailand for three weeks (Fifty is beside himself with sadness). Anyone who wins these candles will be the proud owner of authentic Le Petit Village merchandise, made by Honey Jr and his amazing bees. 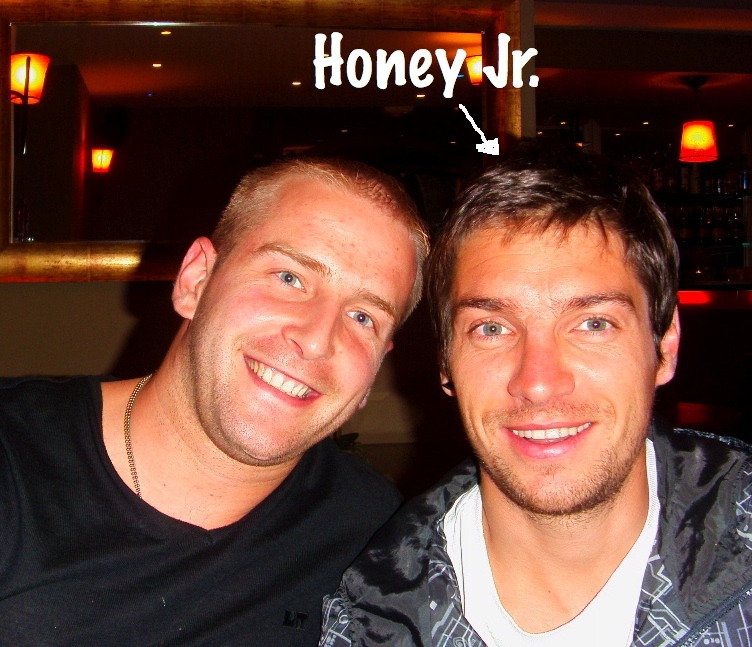 To have a little part of Honey Jr sent to your home, all you have to do is leave a comment. For an extra entry, become a follower and leave another comment saying so (and if you already are, which I'm guessing you probably are, leave a comment about that too), and for a third chance, become a fan on Facebook (and then leave a comment saying that also). Easy as honey pie. Contest is closed next Friday the 21st. (be sure to leave contact details). P.S. Thanks for all the happy thoughts you sent me. Ooh, I'm definitely a follower, and I sure love beeswax candles! Oh and I think somehow I deserve extra points for being the first commenter... Haha. When I was little my mom would buy us soft sheets of beeswax and we'd make them into candles or just mash them into useless balls of wax--when we were really little! Haha! I signed up as a follower! I'd sure love one of Honey Jr's candles. Honey Jr goes off to Thailand for 3 weeks and you sneak into his house and start giving away his prized candle collection? P.S. I'm a followed and a Facebook fan thingy. P.P.S. If you are going to do the "Honey Jr's Prized Possessions" giveaway thing - has he got any Rambo DVDs lying around? I'd prefer if Honey Jr. came included. Sara, love beeswax candles are you sure you can't throw Honey Jr in as well? PS I was also saddened when I read about your crystal and china, same thing recently happened to a friend of mine. How could anyone possibly resist this giveaway? Of course I'm a follower...how could you think not! I'm a follower déjà and up for this delectably fragrant give-away. Does that count as one or two entries (above)? Just checking to see if I'm a follower on FB (one loses track...). Perhaps he could deliver? I won't mind waiting til he gets back to France. Actually, he could bring Fifty as well. I'm a bit disappointed. When I saw the title of your post I thought you were giving away Honey Jr. I suppose the candles are nice too. And now I know what they mean, you're a love machine"
I really can't follow Sophie's comment. That's all. i can't stop coming back to look at honey jr. Does this mean I've won? I knew following this blog would pay off some day. Sign me up for those candles. I'm a follower, big fan..... therefor pleaseeeee pick me! Je suis un fan sur facebook! Ooooh, will Honey Jr be delivering said candles? (I've always wanted blue-eyed children...but shh, don't tell C *S*). PS. I'm a fan on FB now too! we go way back...i've been a fb fan from the first days of your fb page AND i think you're a clever, clever girl for posting eye candy and having us comment. very clever indeed. I also vote with including Honey Jr in the giveaway ;))) I'm a follower! I'm in. But just for the candles! And I'm now a FB follower. Can't believe you didn't kill that delivery man on the spot. So unhappy about your china and crystal. oohhh how I love a contest! enter me. I would like if Honey Jr delivered these to me personally ;) Cute, cute, cute! I'm a follower, of course! Also, if you plan to give away Honey Jr anytime soon, I will be there in a heartbeat -- so adorable. i.e. For only 19.95 you get these genuine, handmade beeswax candles directly from the hives in Provence. you also get a striking, handsome, Provencal man, HONEY JR. He comes with a delightful French accent, all of the necessary male accouterments, AND he loves dogs. Already done on all 3 counts. Seems like honey Jr could do a mail-order girlfriend if he wanted! One lucky girl gets honey Jr, you'd get a new English speaking girlfriend. Win-win for everyone! Honey Jr. is adorable. Does anyone else think he looks like Jude Law? I love the candles. Sorry about your china. Can you purchase replacements? It won't be the same but maybe it would make you feel better. Um. How old is Honey Jr? I have a younger sister. Let's set them up! She doesn't speak much French, but whatever! And I'm all over the candles and a follower. Fanning you on FB. Never noticed that. I'm a follower! I'll take some of those candles! But wax candles! I can really appreciate wax candles, especially homemade ones by a handsome frenchman. Sign me up! PS. I'm SO sorry about your broken shipment of crystal and family heirlooms. If I were on your continent I would help you egg the deliver guy's truck. If I don't win these babies, can I buy another set from you or Honey, Jr.? I must have them. Really. Must. I'm still feeling badly about your china....and mad at UPS or whoever treated your treasures so poorly. Wow, I see why you call him Mr Honey. And it has nothing to do with the bees. Would love to win these, do they smell sweet as they burn? They must, surely. Yummo. And yes, I'm already a stalker, er, follower. I am laughing uncontrollably looking for facial tissues. Still laughing. I'll take these candles! I'd follow you without the candles - oops, I do! But they are lovely and, while I would love to have Honey, Jr. himself, I'd be happy to "settle" for his lovely candles. Thanks, Sara!! but i do love candles so i would be thrilled either way! Thanks so much for stopping by my blog because now I found your blog! I absolutely love beeswax candles, I made some myself as a kid. I think they smell wonderful. Lovely, lovely! Isn't it fun to give away other people's things?! Will the candles be delivered by Honey Jr? Please say they will. Sara, the candles look lovely, but possibly too good to burn! Love reading about your adventures. and have just "Liked" you on Facebook too. Thanks. Un fan sur facebook ... sur votre page et ont été un adepte pendant un certain temps! I was in my own le petit village called Rignat (near Lyon) up until a few days ago! Saw and ate from the pizza truck and it made me think of you and smile. dude, if i weren't married i'd be on the first plane to le petit village. can i say that? just did. it's almost like having a celebrity crush. I'm a follower all the way from Seville, Spain. Would love to win those wonderful candles.